Guard tour software apps allow you to track your security officers by GPS and receive reports and alerts from your mobile guards in real-time. Over 70% of the security guard industry now uses some sort of mobile guard tour software solution for officer management. A guard business needs to offer real-time situational awareness to their customers in order to compete. And the best guard tour software app technology is easy to use and deploy and easy for your customers to access. GuardMetrics security officer tour system software was—and continues to be—developed by experts with decades in the security guard field. We specify “field” because the beauty of this guard tour app and attached security guard management software is in that it was developed by software developers with decades on your side of the fence. Our lead developer learned software development, and built this guard tour app, because he wanted a better way for your mobile officers to get your security guard business what it needs in order to, in turn, give your customers what they need; all this while making the data usage the equivalent of sending a text, so that your officers can even use their own mobile smart-phones with this system without using up their data and battery life! That is how the best security guard software apps perform. Call us today, or click here, to see why this user-friendly officer tour app might be the best guard tour software for you! And what is true for our technology is true for our guard tour system SUPPORT. Our team has decades of experience in the guard business and so understands your needs. We understand that the security business is 24/7; the need for security doesn’t stick to banker’s hours. Yet, so many of our competitors seem to think that Monday through Friday, from 9:00AM to 5:00PM is all the system support you could need. Research often reveals that these guard tour software providers are simply app developers who decided that the guard business would be a nice place to make money. That is also why many of the alternatives to the GuardMetrics guard tour software are just fancy GPS tracking apps that confuse your officers and cost way too much. Contact us now to experience the difference of a guard tour app/ software provider with officer management experience. And this guard tour software is designed so that your customer never needs to know our name. That is because everything is branded to your business; your logos, your company name and—upon request—a branded marketing/ bid piece to show your prospects the caliber of officer management system that you can bring to the table. And with unique and crucial services like the Community Security Portal and Facility Access Control, your potential customers will be impressed. The system includes a mobile guard tour tracking and reporting app that works on iPhone, Android, windows phone; any smart device, and uses so little data that it can be run on your guard’s personal mobile phones. It also includes a Management Portal, from where you run the operations, a Client Portal to provide approved reports to your clients in real-time, and the Community Security Portal to provide a layer of security that 95+% of your competitors cannot provide. 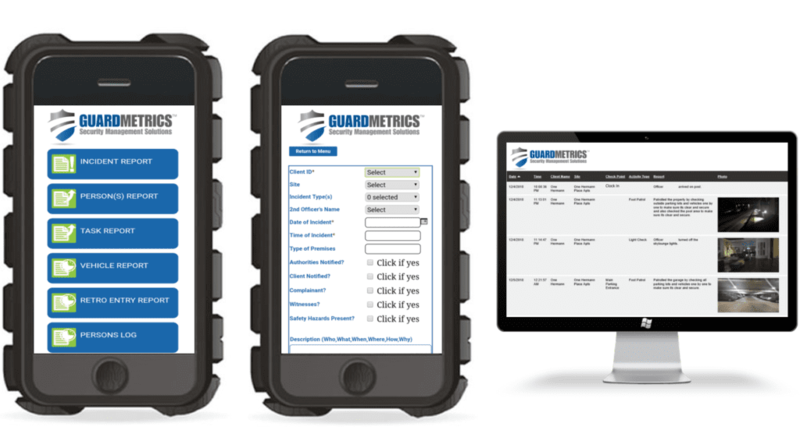 Call us for a mobile guard tour software app and guard management app that is branded to your security guard business!